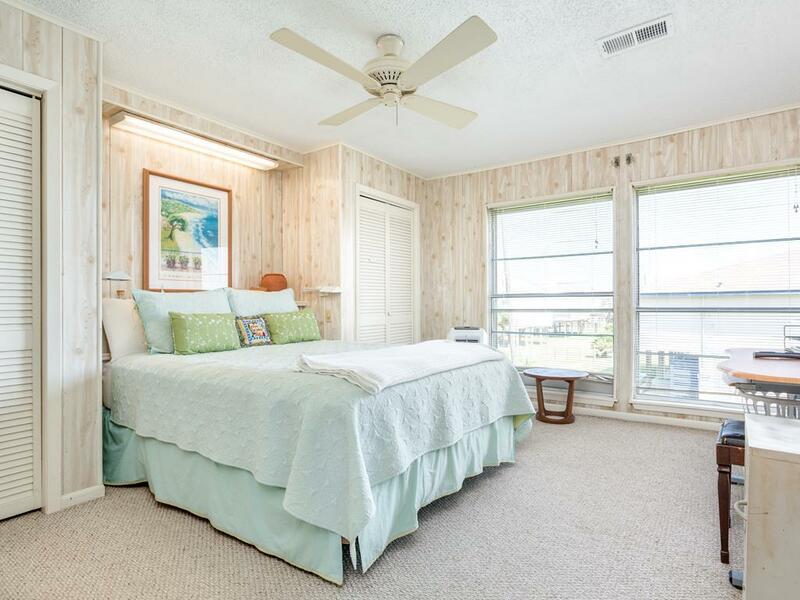 Cozy beachfront vacation rental with private baths for each bedroom! 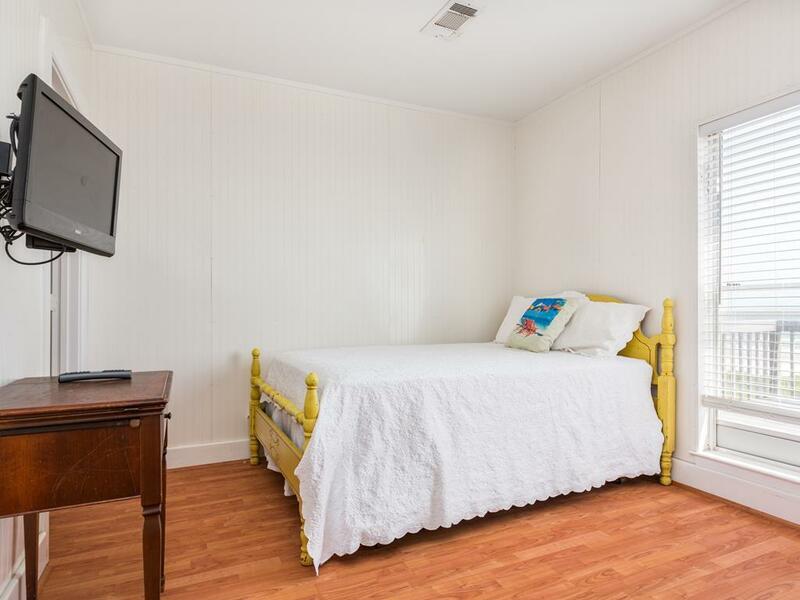 Ideal for families with two living areas, a large kitchen, and a king suite, queen suite & bunk bedroom suite with a full bed too. 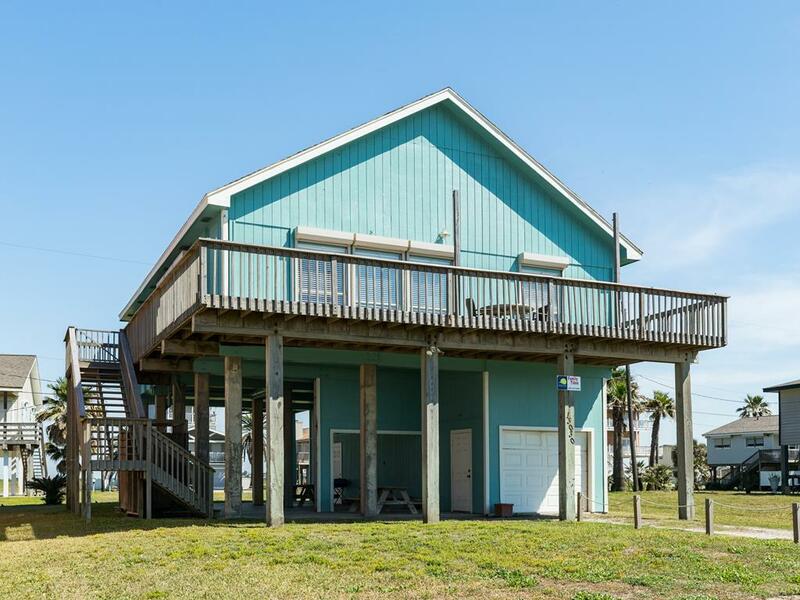 This single level home is just steps away from the water and only 10 miles to downtown Galveston. 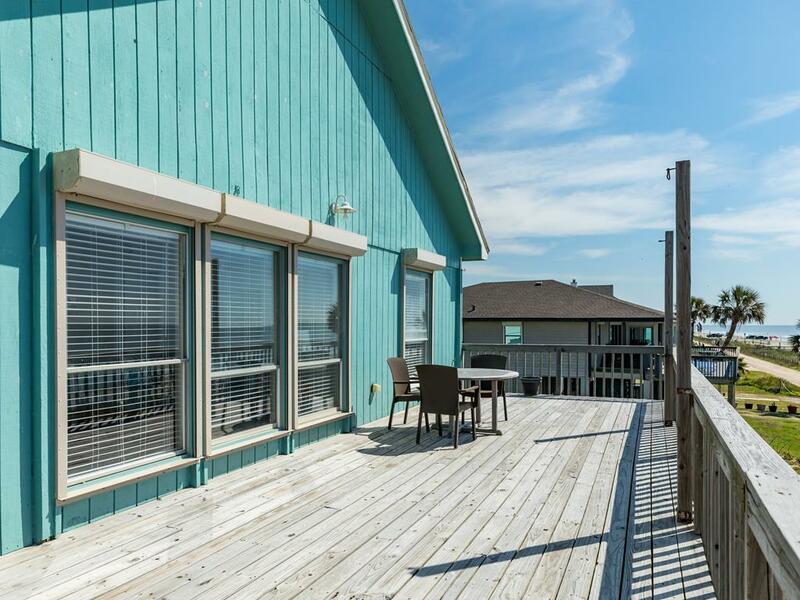 Head to the sand and surf or sunbathe on the deck with a cool drink in your hand! Not upscale, but has lots of open living space. The portable air conditioning unit are not as effective as I would have liked with lots of air leaks. The kitchen and baths were small, but I wasn’t at the beach to cook gourmet dinners. There are three en-suite bathrooms which was wonderful. The outside shower was a plus, as was the long outside hose. Been booking with SnS for decades, and any issues, though rare, are always handled promptly. Plus I like the Beach Club Loyalty program that earns me free nights! It's great for 3 couples because each bedroom has it's own bath. What a plus!! If location is your number #1 desire, this is an excellent property. If you want a completely modern house this is not for you. Love having 3 full bathrooms! On the beach, great views. 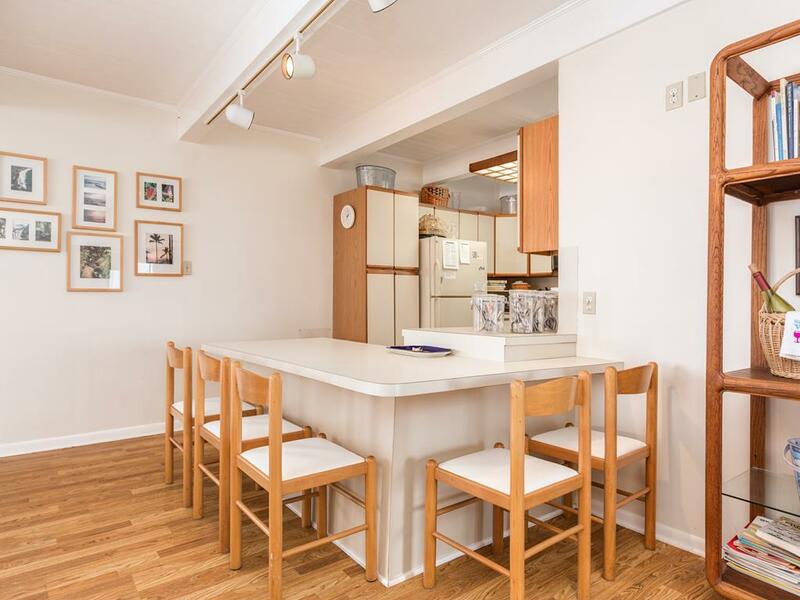 Well stocked kitchen, 2 sitting areas. 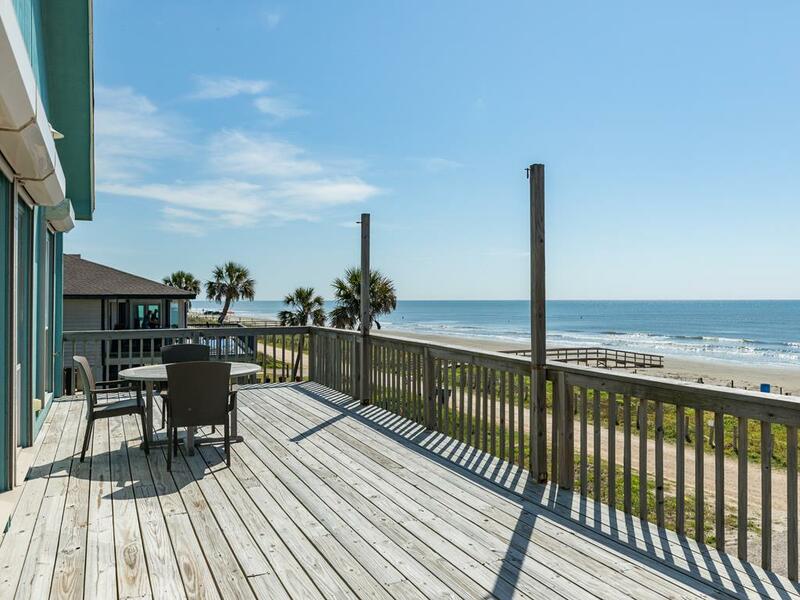 Love love love this beach house! Will rent again over and over! So much space for the 6 of us! Great location! We are a family of six and found the property had plenty of room inside for people to enjoy different activities at night (play games, read a book, watch TV). I forgot to mention in my earlier review of how quick the ladies at the Rental place were in helping us get the lights fixed downstairs in the patio area and most of all how much we appreciated them getting us a bbq grill so quickly as they did. We were about to go out and purchase one. Great Job Ladies!! Very nice comfy home. Had everything we needed. Had a wonderful time. The only downfall was that there are signs posted everywhere to beware of rattle snakes and we did run into one crossing the over pass to get to the beach. Scared my grandchildren to death. That would be my only downfall of not renting in that area or subdivision. We still had a great time. We are glad you enjoyed your stay! Rattlesnakes can certainly be startling! We are glad that the signs kept you on the lookout and safe. They are a natural part of the ecosystem here and found across the island, so it is something that we remind our guests to keep watch for no matter where they stay. We hope to see you and your family back again soon! Lovely clean home with a great gulf view. It was sure nice that all 3 bedrooms had a full bathroom attached. The staff at Sand n Sea are a pleasure to deal with and helped make our vacation very relaxing. 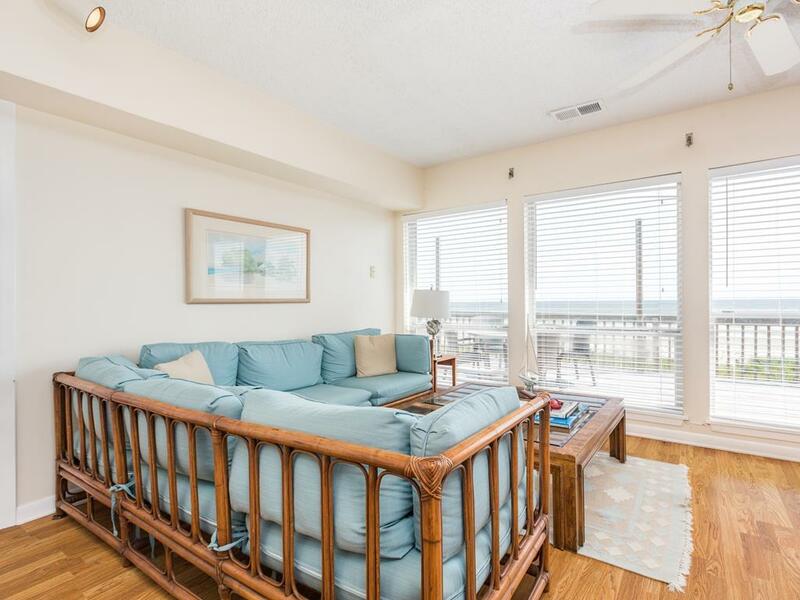 Family Tides was a great beach house for a girls trip. Malissa was wonderful coordinating a late check in for us and helping with ideas for our stay. The beach house was outdtated but had a bathroom for every room, was clean, very comfortable, and right on the beach. Fit six ladies nicely. Couldn't ask for a better location. We fully enjoyed our stay! Clean, comfy and cozy! We loved it! Wonderful beach house, right on the water!!! Had awesome time! We enjoyed a weekend at Family Tides with our children and a couple we are close friends with, during the weekend of Hurricane Patricia. Despite heavy winds and rain, we thoroughly enjoyed the proximity of the home to the sea, the cozy furnishings and the layout of the house. We spent the weekends dipping into the ocean for brief swims, walking along the beach and playing Scattergories, in addition to many hours of catching up with one another. We found this property to be very comfortable for 9 people and appreciated having three bathrooms, one in each bedroom. 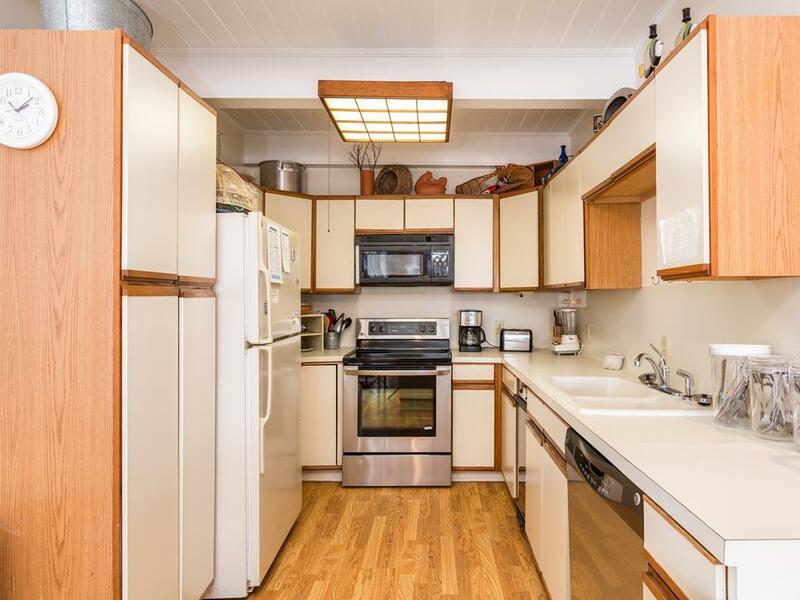 The kitchen was well equipped and we had a great experience being steps away from the beach. 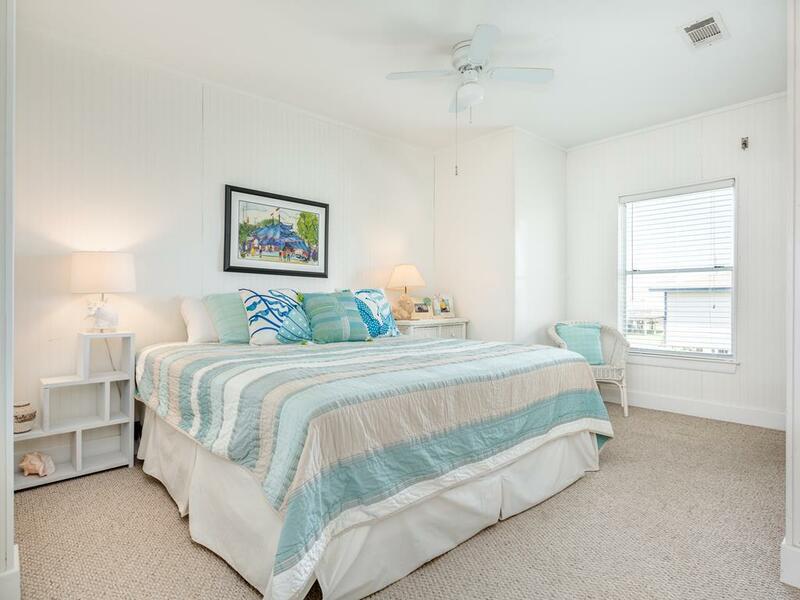 Family Tides has a great location and is the perfect size for an extended family stay at the beach. The house is a little older and shows some wear in places, but that did not diminish our enjoyment at all. AWESOME layout and 3 bathrooms is a BONUS! GREAT view since you are right on the beach. NO beach traffic. This was a great beach house for our family. The three bedrooms/bathrooms made everyone very comfortable. The two sitting rooms were nice. Had everything a family could want -- games and a great view of the water. We would probably want to stay here again. 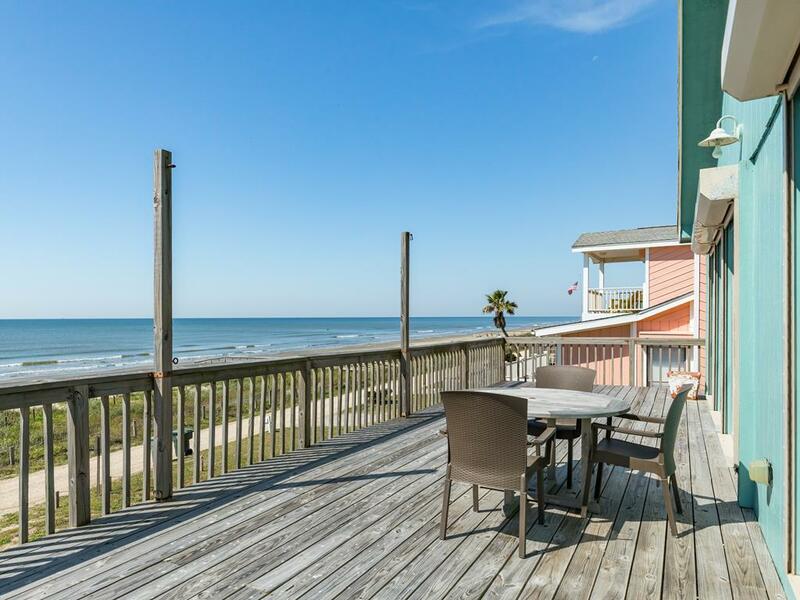 This was our first beach house rental and it was great. The house was clean and well equipped. It fit our needs perfectly. 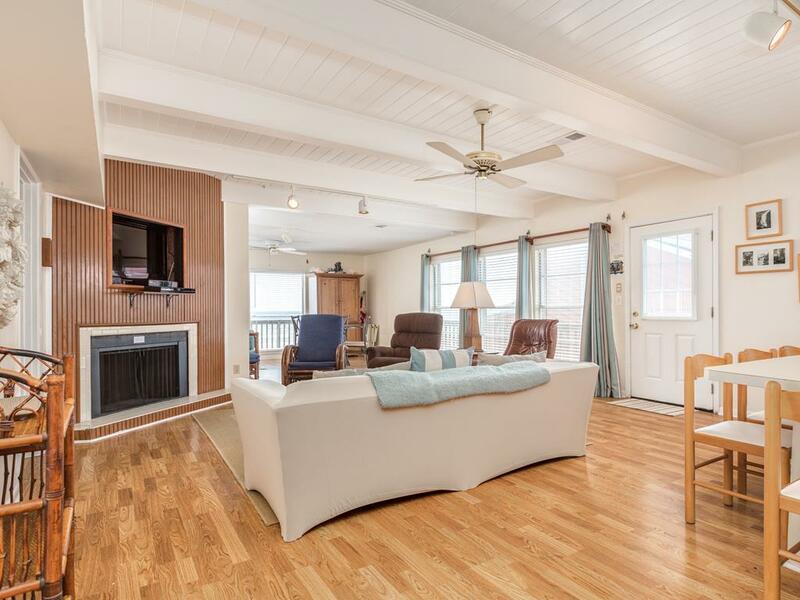 This is a great house, perfect location, with super-easy access to the beach. It's large and very comfortable, and is on tall, sturdy pillars so it does not sway like some others do. We had a VERY relaxing vacation. Would definitely rent this house again. What was good for us was each bedroom had it's own bath. Wonderful old beach house, obviously a well loved family home. Front row location is outstanding. Floor plan with 1 level and 3 bedrooms/3 baths was ideal for our family of 3 couples with 3 toddlers and 1 baby in tow. The bedrooms are very spacious and the beds were very comfortable. We really enjoyed out stay here, however, I think the house is slipping from quaintly outdated to falling into disrepair. Needs updating and repairs to the kitchen and bathrooms. The kitchen pots and pans are a hodgepodge and we were able to cook for our family of 9 only because I brought 2 cooking pots with lids from home. We were disappointed to find only 4 cheap plastic chairs on the deck because all of us enjoy sitting out in the evenings to enjoy the breeze. We had to take out beach chairs up to have chairs to sit in for the 8 of us. Even with the negatives, this is a lovely beach house house and we would consider it again if some more attention was made to minor updates and maintenance. This house is an EXCELLENT place to rent!! The house has alot of space and the kitchen is stocked with cooking supplies!! We LOVED that it has 3 bedrooms with 3 bathrooms and 2 living areas! 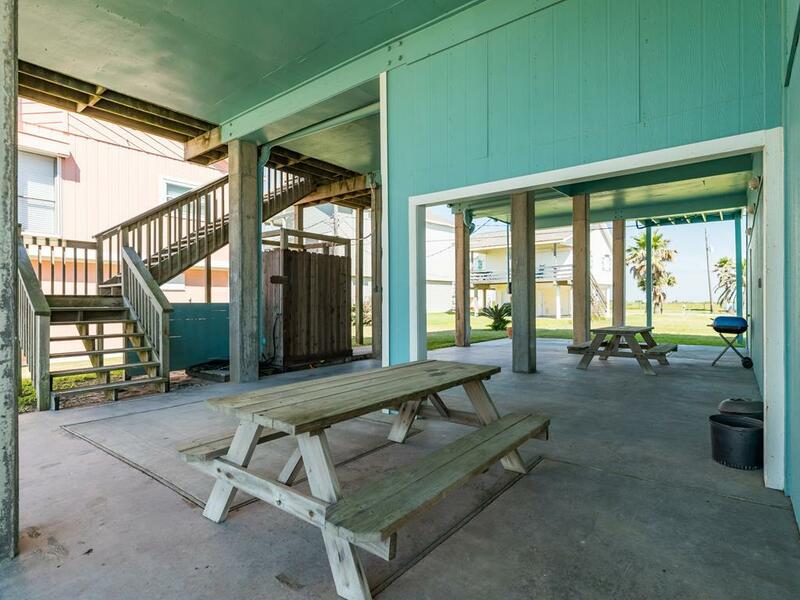 Perfectly located, nice clean beach house! A full bath with each bedroom was a major plus! Nice and quiet and relaxing area! Needs a little updating but nothing major. Would definitely rent again! We just finished our annual summer beach vacay and decided on this property. Loved loved the layout. My 19 year old son had a couple of his old HS buddies come down and they loved hanging out on the great porch with the waves crashing and discussing what guys do. 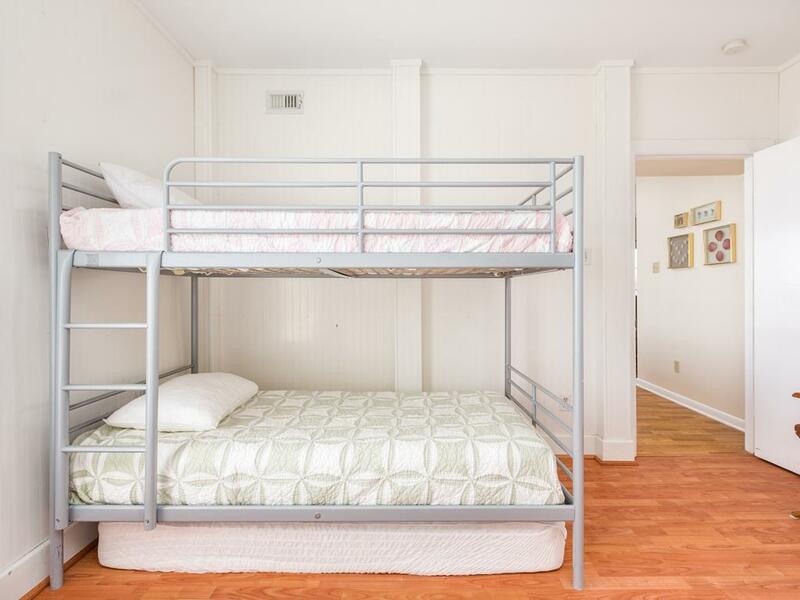 The bedroom closest to the ocean view was quite accommodating for 4 boys_a queen, trundle, and bunk beds. My daughter and my boyfriends daughter were quite comfortable in the middle bedroom and because each bedroom has its own bathroom, it was perfect. I do have 3 complaints: (1) It rained for the first 2 days of our 4 day vacay_and there was abnormally large amounts of seaweed_.but that is beyond any one human's fault; (2) Make sure you bring things like a griddle, decent knives to chop with, another skillet (there was only one huge one and one like individual egg one; (3) the chairs on the deck were so rusted I was afraid for my 6'2" boyfriend to sit in them_but Sand and Sea brought some plastic ones over. If you want a recliner or lounger to sunbathe in you need to bring your own; (4) There is no place to store your fishing poles or outside beach equipment. Both doors to the garage are for the owners use_. also the outside shower handles are completely rusted off so there is a shower_but there is NOT a shower. There is a water hose however. I probably WOULD rent the place again but just be prepared to bring those things. The layout with two living areas is perfect. Great place for family especially with smaller children who you want close by. Right on the beach. Great deck for sun worshipers. Nice breeze downstairs so perfect for cooking out and eating on the picnic tables. Clean, beds feel new. Having the Galveston country club pool was a very nice bonus we really enjoyed lounging by the pool and having lunch poolside. I will rent Family Tides again and again. 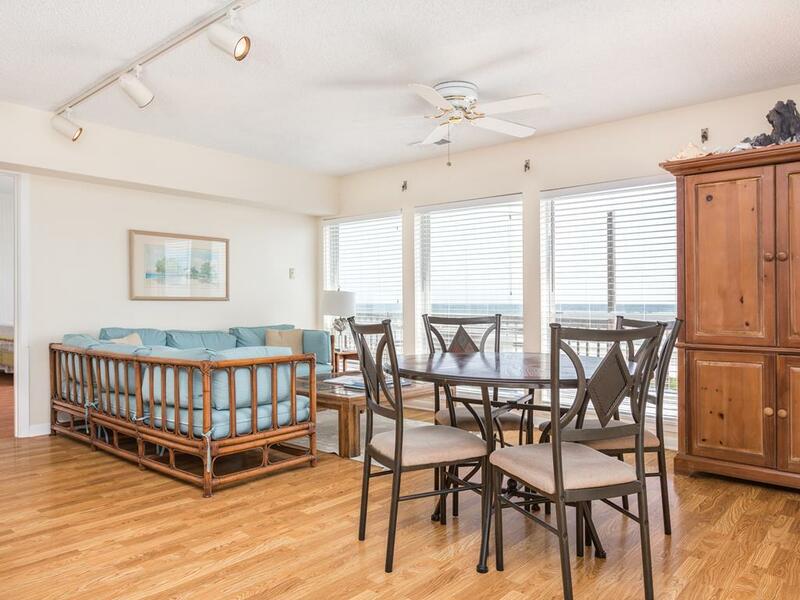 Family Tides has a wonderful "great room" in which to gather where there is a beautiful view of the ocean. Awesome property - you can't beat the 3 rooms with 3 bathrooms!!!! AWESOME!!!!! The house is awesome, loved the 3 bathrooms!!!! Annie at Sand 'N Sea is wonderful. I would definitley stay here again and recommend it highly. 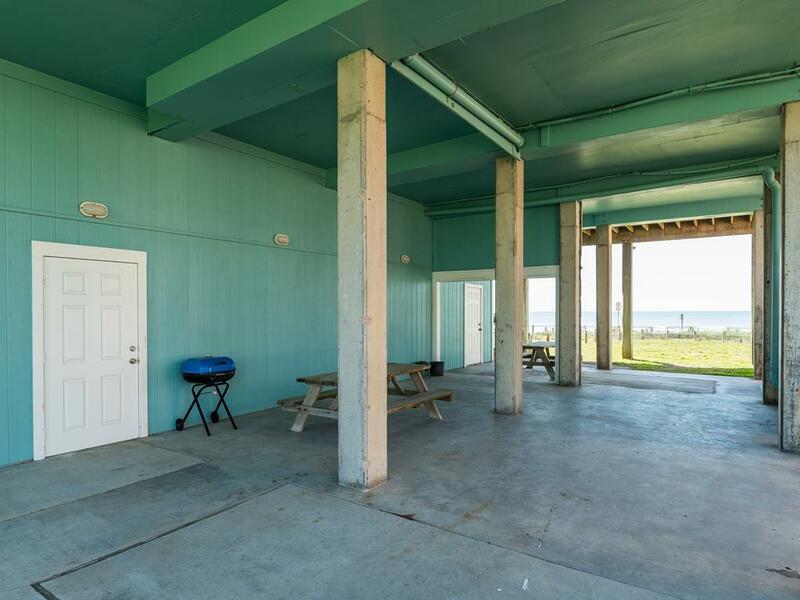 This property is in a great location, right next to the beach. Also has a wonderful sunset view. 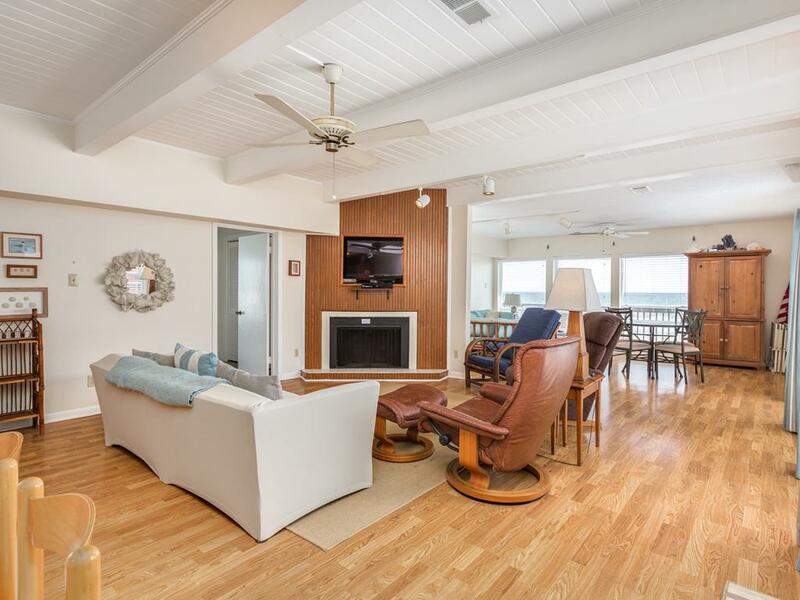 This property and one next door Amore Del Mar are excellent for a family vacation at the beach wish this one had a covered deck tho. Kitchen utensils were sparce, but clean. Just a short walk to beach, easy for keeping eye on the grandchildren! WAS A PERFECT PAIRING WITH AMORE DEL MAR NEXT DOOR. FLOOR PLAN GREAT. WISH IT HAD A COVERED DECK, HOWEVER VIEW WAS GREAT. PERFECT FOR OUR BUNCH. I already did a review. Family Tides is very spacious! Having two living room areas was great. Grandpa sat in the main living room and watched TV and the grandkids sat in the other living room around a nice big coffee table and played board games. Being right on the beach was the biggest plus! And having a large outdoor shower was also wonderful! That is where the grandkids took their showers after playing on the beach. Having three bathrooms was great! My oldest grandson would put the US and Texas flags out each morning on the deck. Nice little touch! Very comfortable home! Bermuda Beach is a good spot, not too far from Galveston. Will definitely return! Well layed out floor plan. Was really nice to have a bath in each of the 3 bedrooms. This is a great house and location. 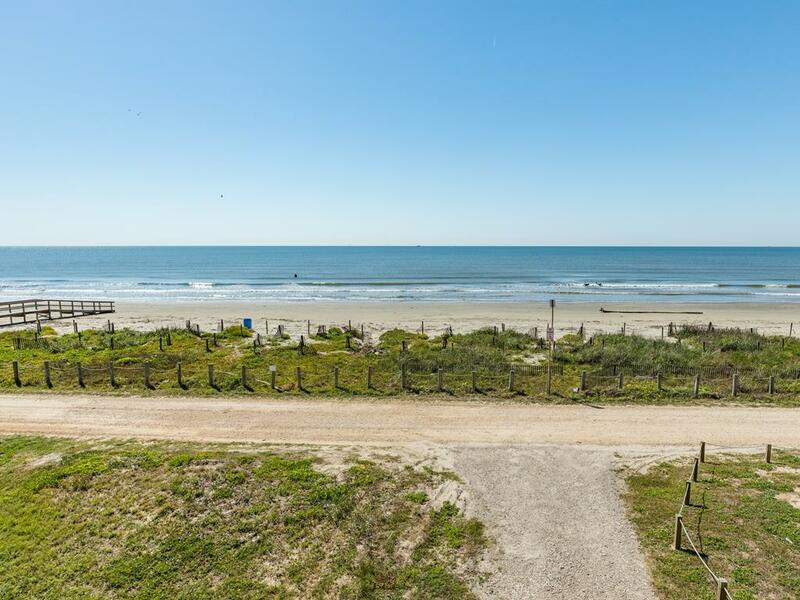 Easy to the beach and to the city of Galveston. The design of the home is laid out and decorated nicely. And having the flags on the front deck made it easy to spot from the water.